Lighting can have an inspirational effect on design. It is the essential element that can enhance or diminish the rest of the design. Finding the proper balance between quality and quantity of light will not only enhance the environment, but will make occupants feel more comfortable – which in turn contributes to productivity. Good lighting has a direct impact on human mood and social behavior. It can help curb fatigue and lack of concentration. In a study completed by the National Center for Biotechnology Information, researchers studied the impact of light on psychological mood in indoor work environments. The study found that workers’ moods were at their lowest when “the lighting was experienced as much too dark.” Workers’ moods were at their highest level when “the lighting was experienced as just right.” However, too much light or conditions that were too bright, caused workers’ moods to decline. Proper lighting is not only a good design decision, but also an ergonomic requirement. 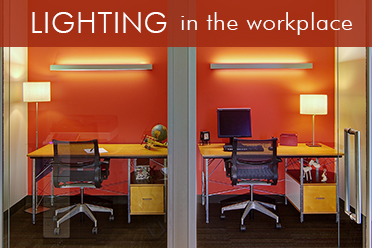 Because lighting influences personal well-being, it also leads to motivation and performance. In the workplace, 80% of information is processed visually. EYE STRAIN: According to a study by Cornell University – which looked at the effects of poor lighting on workers productivity – 24% of workers experienced vision problems that resulted in work time losses. This averaged 15 minutes per day. Over 1 year, these losses amounted to one week of LOST work time per employee! Prolonged periods of eye strain can also take a toll on the body’s energy levels, which affect mood. ENERGY LEVELS: Circadian rhythms – which determine one’s waking and sleeping cycles – can be negatively affected by poorly lit workplaces. When disrupted for long periods of time, the body’s energy levels begin to decline which ultimately impacts a person’s psychological or emotional state. Can you imagine losing productivity in the workplace because of poor lighting? How does it feel being in the dark about such an important aspect of your business?? BSI’s Electrical Services Can Help! BSI’s Electrical Services Department includes three Master Electricians, a journeyman electrician, an apprentice, and a full-time Lighting Designer. We can help you determine not only the correct amount of light for your space, but also the right KIND of light. Contact BSI today and ask us how we can help you increase productivity in your workplace through our ten principles of Productivity Based Design. This entry was posted in Lighting & Electrical Services, Tips for your Workplace. Bookmark the permalink.